Elliot A. Strokoff and James L. Cowden have been practicing law together since 1974. 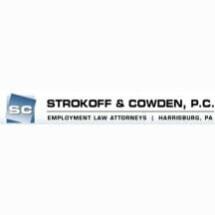 We formed Strokoff & Cowden, P.C. in 1987 as a small firm with enough experience, personnel, and resources to serve statewide clients, yet small enough to provide individual attention. We are proud that other law firms from within and outside of Pennsylvania contact us for our expertise and assistance on special matters. While we are pleased to count among our clients important associations, businesses, lawyers, judges and community leaders, all of our clients, from all walks of life, receive our personal and dedicated legal counsel and representation. We do not shy away from challenging cases. We have, through the years, represented a number of underdogs in efforts to try to establish new legal precedents. If you read some of the cases summarized in the Case Sampling, you should get some indication of the depth and breadth of our legal experience and skills. Office Hours: 8:30 a.m.- 5 p.m.